Toddlers love nothing more than to explore the world around them with their five senses. Everything is new and fascinating to them. It's such a magical thing to sit and observe as a parent; the seemingly simplest of things are awe inspiring to them. Our toddler is currently 2 years old, and he's been reveling in all things nature related this season. Being outside delights him in a way that nothing else does. It's his happy place. While we've been experiencing a bit of heat wave in our area this week, we chose to use the heat to our advantage and get creative, rather then run for air conditioned spaces. I whipped up a batch of ice paints using a simple recipe, an ice tray, and wooden Popsicle sticks the night before, and set everything up under the shade of the trees in our backyard. 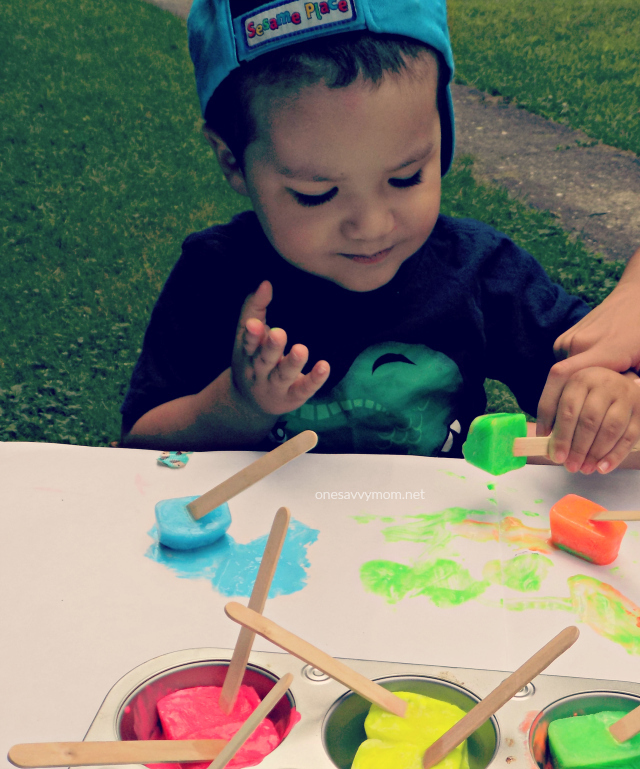 This activity was definitely a hit with my toddler, and my older daughter loved it too. 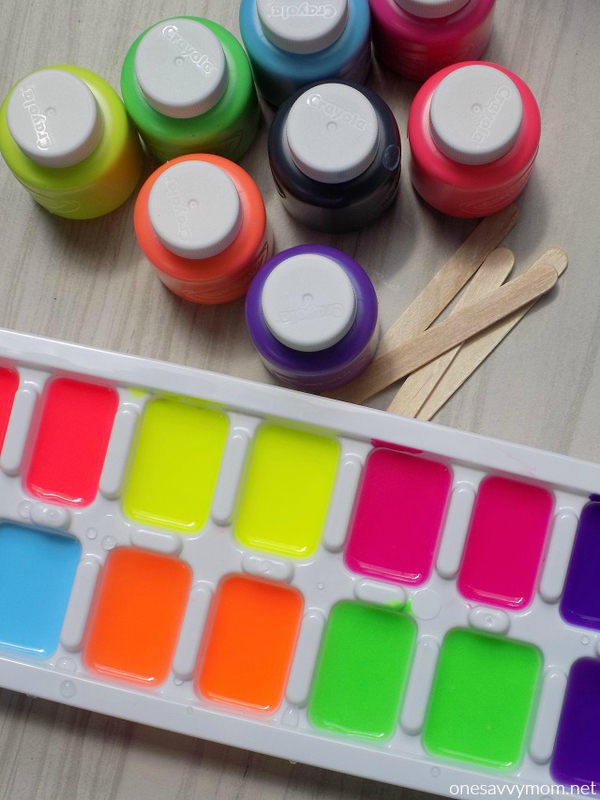 Read on for my simple recipe for ice paints + quick tutorial, to whip up a batch of ice paints for your toddler to enjoy this summer. 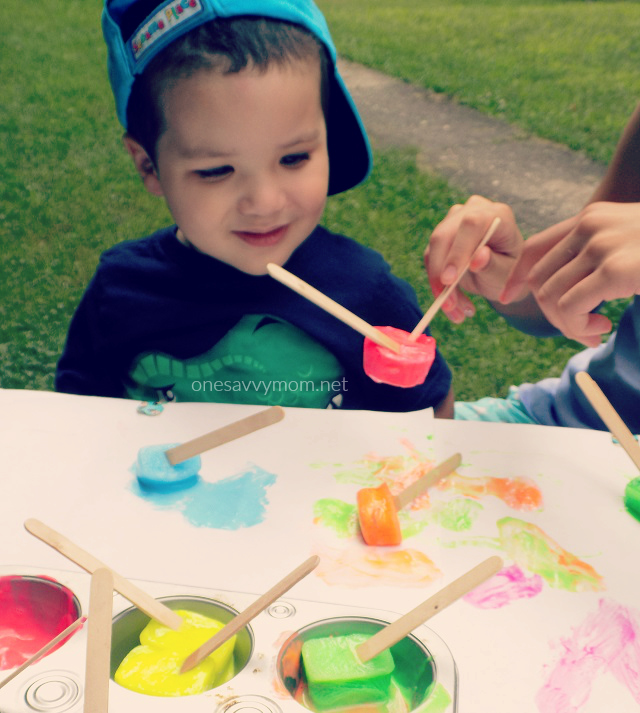 Washable non-toxic kids paints (I found a box of fun neon colors to make our pictured paints - I thought they were perfect for summer! 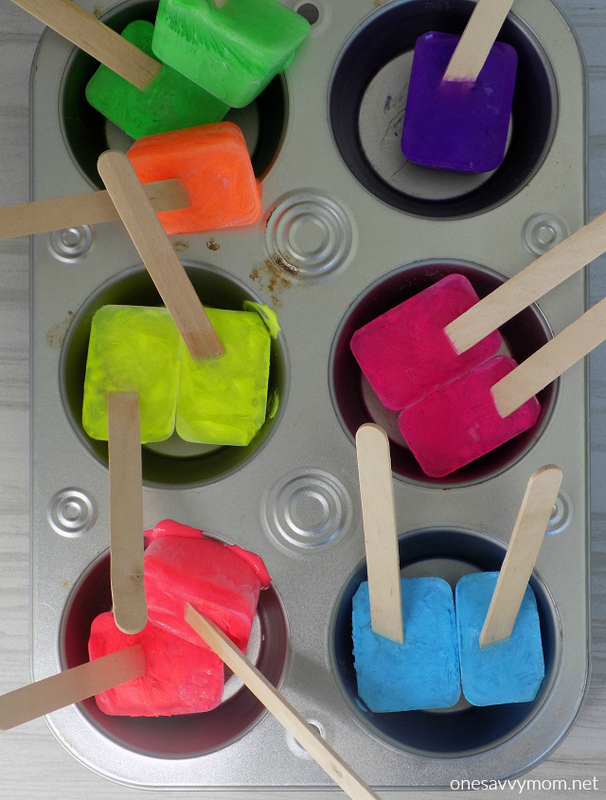 Mix 1 teaspoon washable non-toxic kids paint + 1 teaspoon water in each space in your ice cube tray - using various colors. Place a wooden Popsicle stick in each space in your filled iced cube tray. Remove ice paints from ice cube tray and place in an old muffin tin. On a warm summer day, cover a tabletop surface / sidewalk with heavy white craft paper (making sure to secure to the table/sidewalk with tape). 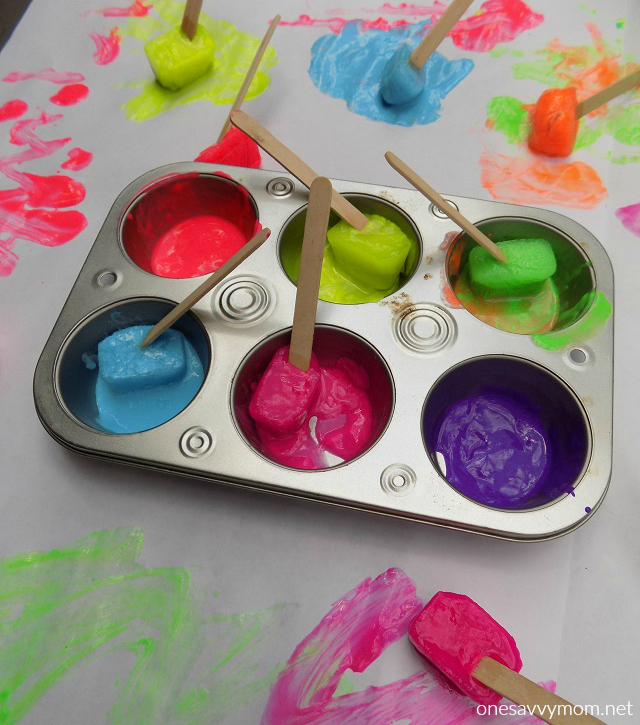 Set your muffin tin full of ice paints out alongside your heavy duty craft paper (that was previously secured to the surface) and let your little one get creative. At first, my toddler was mesmerized by the melting action that was taking place when we simple set the ice paints down on the paper. With a little coaxing he quickly learned that by gliding the ice paints across the paper he could make lines / patterns as they melted. He was also pretty intrigued when two of the ice paint cubes got stuck together from the condensation/melting process. Overall this was a cool summer activity to do with the kids, that took very little to put together. If you're concerned about making a mess, let your tot wear their swimsuit while they use the ice paints, then take a dip in a splash pool or a run through the sprinkler to cool off / get the paint off afterwords. This is a such a fun and memorable way to get out and enjoy the warmth of the summer sun with little ones. We've done this in winter and it was still a lot of fun. We put the paint water outside, overnight in the freezing cold. Then the kids painted on construction paper. They had a blast.